Nachos Grande: Delivery Time! 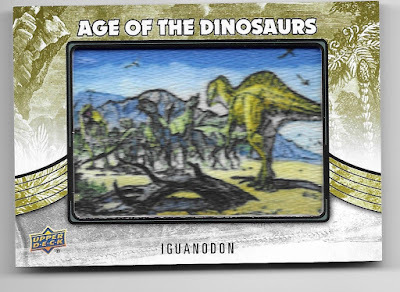 More Prehistoric Cards! Back in the middle of December 2018, I made an eBay order that included a bunch of different cards fro the 2015 Upper Deck Dinosaurs set. Three of the cards were the final three cards that I needed for one of the insert sets (which I've already shown off a couple of weeks ago). Today, we take a look at the other cards that I picked up. First up, the accidental card that I bought. The Spinosaurus is the last of the regular base cards that I need for my set. Unfortunately, I was hasty in making my purchase and I didn't realize that I was buying the "Extinction Red" parallel instead of the normal base card. I'm too much of a Type A person to allow myself to have a single parallel nestled in my binder when every other card is the correct base card so I'll have to track down base card #12 yet again (but at least now I'll know to be careful when I buy it)! Now, to be fair to me, this wasn't a duplicate when I bought it but in between the time I bought the cards and the time they arrived at my house, I ended up with someone else trading me the exact same card. This one will probably end up being used for future trade bait in an effort to track down one of the many other patch cards that I need still. So far, not a lot of positives to report, right? Well, luckily the final two cards of the purchase will make everything okay. 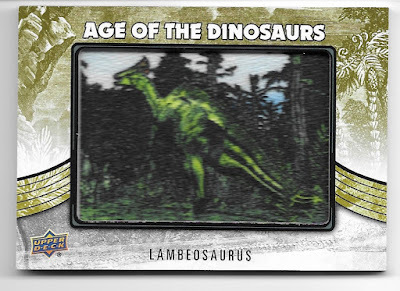 The first of the cards that I actually needed is a different Age of the Dinosaurs patch card, this one of Lambeosaurus. The Labeosaurus was an herbivore who was kind of similar to the more famous (?) 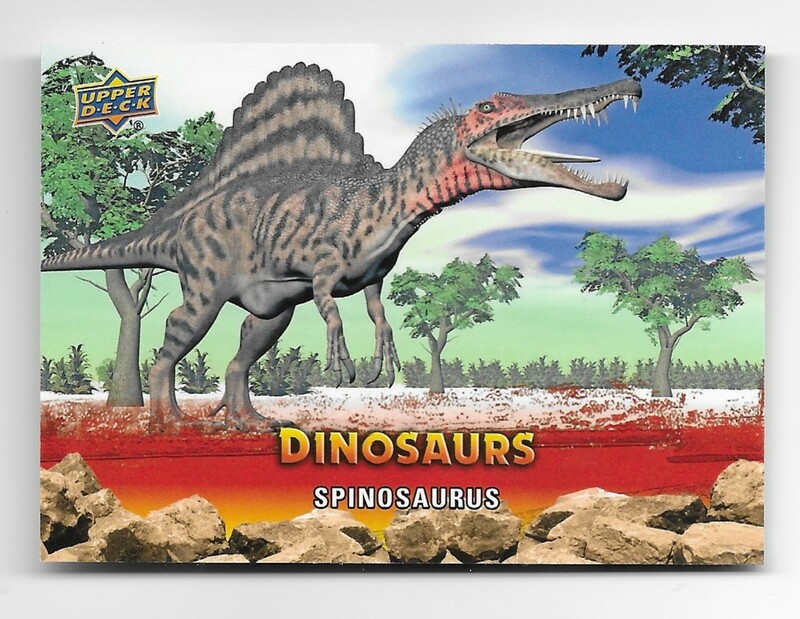 Corythosaurus. The patch is a little bit dark (especially in the scan) but I do like the imagery of the dino walking in the forest. The patch set is 60 cards in size and each hobby box holds exactly one patch card. Even worse, there are multiple rarity tiers within the patch set - some patches are as tough as 1:578 pack pulls. I don't have any expectations that I'll ever complete the set but if I can find cards I need for the right price I'll still pull the trigger. Even having a few of the patches is nice for the collection! Finally, we get to the crown jewel of the purchase. 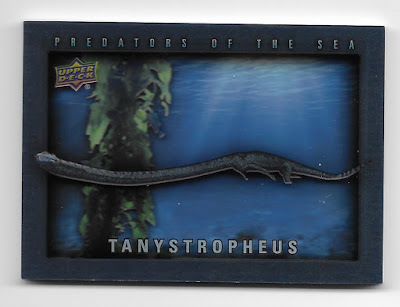 The Tanystropheus Predators of the Sea shadow box card. The Predators of the Sea cards are simply stunning to behold. The set itself is only 20 cards in size BUT the cards are seeded one in every two hobby boxes. At least all 20 cards have the same relative rarity. My collection now has six of the twenty cards in the set. Not great, but not bad either considering how tough these are to find (especially at a decent price). 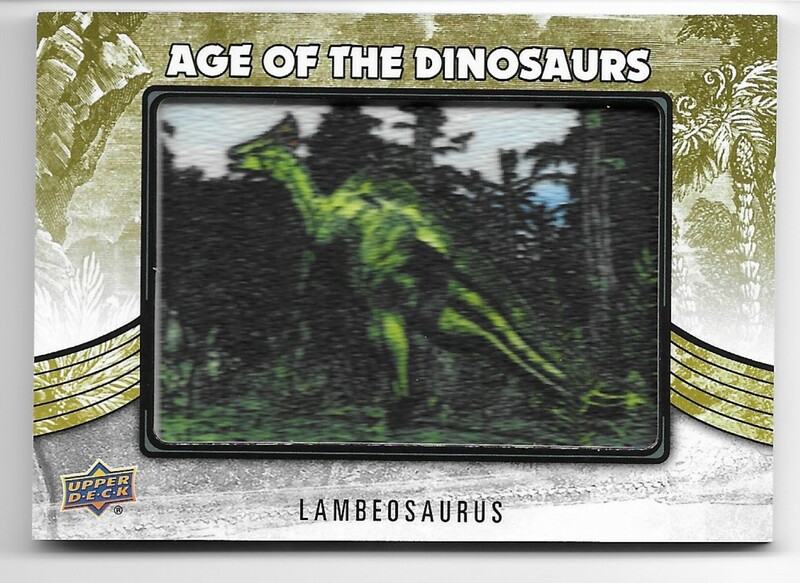 My efforts of collecting the 2015 Upper Deck Dinosaur set are not done quite yet. In fact, I've already ordered (but not yet had shipped) a number of the remaining base cards that I need from the set. I'm also always on the hunt for other Predator of the Seas cards that I could use as well as the patch cards. If you happen to have any available, let me know! Awesome...reminds me of the Wild West in the early 1990s when anything and everything was printed on a trading card. Wonder how many of those kids grew up to be Paleontologists?!! These 2015 UD cards are pretty awesome! That shadow box card is beautiful. As for that lone parallel... I feel the exact same way. There's no way I could leave one parallel in the set.